A man who smashed high street shop windows in a New Year’s Day vandalism spree missed his court date. 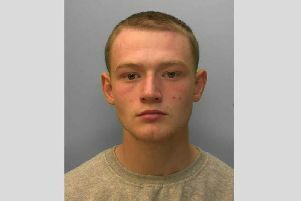 According to his solicitor, Jack Lambeth from Bognor Regis could not attend his sentencing at Worthing Magistrates’ Court on Monday as he had no money to pay for travel. The court heard he had spent the last of his monthly income to pay off a mobile phone and would not get paid again for 10 days. Mr Lambeth, 24, pleaded guilty on January 16 to six counts of criminal damage in the vandalism spree in the early hours of January 1. This included smashing the windows of Sainsbury’s, Image Barber, Little Magna curry house, Needle and Fred tattoo parlour and flats in High Street, Littlehampton. The court heard how the probation service had not heard from him since his guilty plea. Chairman of the bench of Magistrates Helen Ralston adjourned the sentencing to April 9 to give Mr Lambeth ‘one final chance’ to work with probation before reappearing in court.